For this exhibition, Bordowitz will curate a selection of artworks from Daniel S. Berger’s collection. During the opening, the artist will deliver a gallery talk contemplating the porous boundary between private and public spaces. At issue is the ideal of creative freedom. Parts of the body are objects. That sentence almost cost me a toe. I was descending a staircase, feeling my way down the carpet in sock feet. My leg slipped and a crucial memory was stirred. Quick to dismiss the severity of the fall, I tried to ignore the situation even though the damage was evident. A bloodstain appeared through the wool… There is injury and there is art. These two facts merely coincide. Ultimately, composition does not heal. It does not mend. We pretend that there are meaningful connections. Still, things move without us. 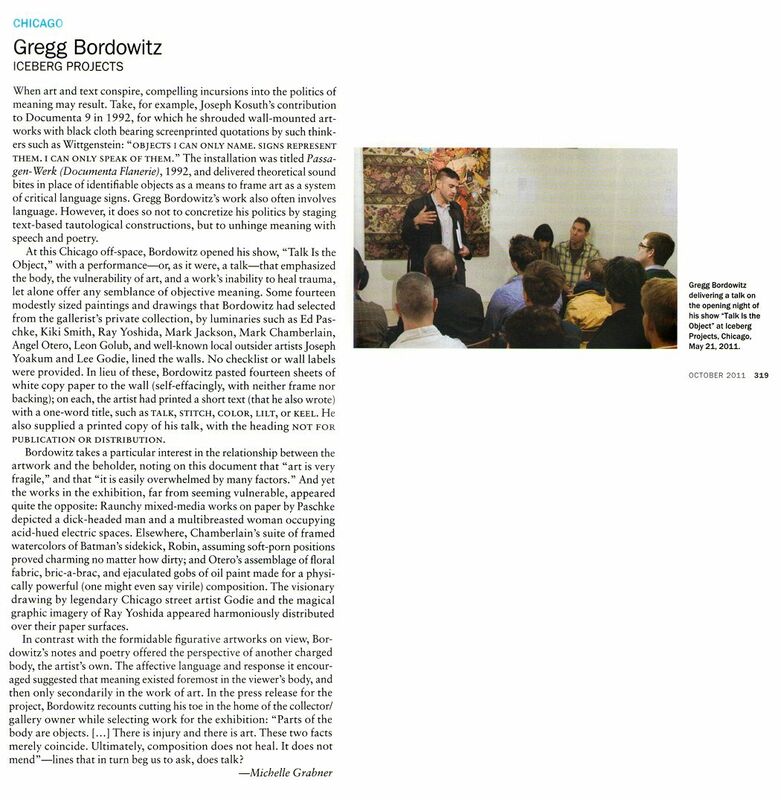 Gregg Bordowitz is a writer and artist. His most recent project is an opera conceived as a collaboration with the artist Paul Chan, titled The History of Sexuality Volume One By Michel Foucault: An Opera, which premiered October 1 and 2, 2010 in Vienna, Austria. His most recent book, General Idea: Imagevirus, was published by Afterall Books in 2010. A collection of his writings — titled The AIDS Crisis Is Ridiculous and Other Writings 1986–2003 — was published by MIT Press in the fall of 2004. For this book, Bordowitz received the 2006 Frank Jewitt Mather Award from the College Art Association. In addition, he has received a Rockefeller Intercultural Arts Fellowship and a John Simon Guggenheim Memorial Fellowship, among other grants and awards. His films, including Fast Trip Long Drop (1993), A Cloud In Trousers (1995), The Suicide (1996), and Habit (2001) have been widely shown in festivals, museums, movie theaters, and broadcast internationally. Professor Bordowitz is currently the Chair of the Film, Video, New Media, and Animation Department at the School of the Art Institute of Chicago, and he is on the faculty of the Whitney Museum Independent Study Program.